Franz Joseph Haydn was born into a poor family in the Austrian town of Rohrau. As a boy he sang in the local church choir where a visiting Viennese prelate spotted his musical talent, and he was offered the chance of joining the Choir of St Stephen's Cathedral in Vienna. As a chorister he received an excellent musical education, becoming a virtuoso performer on both violin and piano. 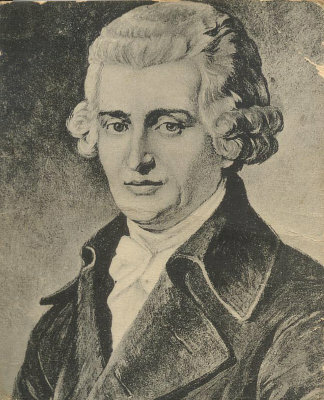 In 1761, Prince Paul Esterházy, a Hungarian nobleman, engaged him as vice-Kapellmeister. For nearly thirty years he worked in that same household, directing and writing for the orchestra and writing chamber music for the Prince's family and visitors, producing a series of masterpieces each contributing vibrant new ideas to the emerging "classical" style. The work of this period earned him the nickname "The father of Symphony" and he equally deserves to be called the father of the string quartet. How he achieved so much in comparative isolation remains a mystery though Haydn himself once remarked "There was no one there to confuse me, so I was forced to become original." When Haydn was in his 50s the first public music concerts began. The promoters of these events were anxious to receive works from composers whose fame would attract the paying public to concert halls. Haydn, already famous in Vienna, was invited first to compose a set of symphonies for performance in Paris and then on two occasions to visit London. He wrote a new set of six symphonies for each trip. The second London set opens with the Symphony No. 99, in E-flat Major, composed in 1793. Like the other late symphonies it is conceived on a larger scale than his earlier works. The first movement opens with a slow introduction which establishes a mood of dark ambiguity suggesting the key of C minor, out of which the vivace bursts with an exhilarating energy. The development section is long and adventurous in its treatment of the musical ideas, and the recapitulation doesn't simply repeat the ideas, but presents them in a new light. The second movement is in the distant key of G major. It contains music of unusual depth and intimacy, and particularly beautiful and expressive wind writing. It has been suggested that the movement is an elegy on the death of his dear friend Marianne von Genzinger. An unusual feature is the use of trumpets and drums in a slow movement. Haydn's minuet is graceful and witty and is filled with dramatic contrasts that incline the listener to think more of a rustic dance than a Viennese ballroom. The trio opens with another surprising shift of key into C major. It is a gentler dance, played quietly throughout. The finale is a sparking vivace following the outline of a rondo movement but with greatly elaborated episodes developing in intensity and virtuosity and incorporating many contrapuntal ideas. New ideas continually unfold, but the music never dips in its drive and energy. Haydn himself conducted the first performance on February 10, 1794 at the King's theatre in London, six days after his arrival in England on his second visit. Haydn's ninty ninth symphony was performed by the Portobello Orchestra on the 19th March 2005, conducted by Anthony Weeden and on the 19th March 2016 conducted by William Church.